Want to cuddle with Karen? Hello and welcome! I’m excited to be part of what I truly believe will be something special … a movement towards restoring and nurturing the acceptance of therapeutic touch and its importance to our mental and physical health. 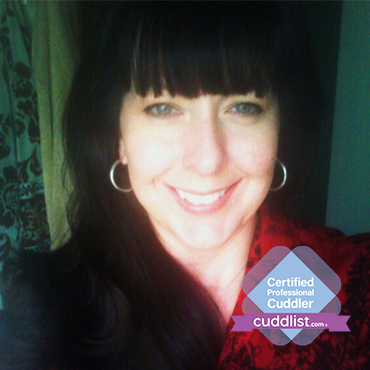 I provide an alternative, holistic approach to well-being no matter what shape, size, orientation, gender, etc. in an unconditional and non-judgmental atmosphere where your confidentiality and privacy are guaranteed. I’ve had 25 years experience taking care of clients who have experienced life altering and/or catastrophic illnesses/injuries so taking care of my clients is ‘in my blood’. I have a deep interest in alternative health care options and am pursuing many avenues in holistic wellness, educating myself in as many various practices as I can including meditation and mindfulness practice. The journey has been life-changing and has had a profound effect on my outlook towards life. I believe nature has the power to heal as well and am a practitioner of Shinrin-Yoku (Japanese Forest Bathing) and plan to be trained to be a Forest Therapy Guide in the future. In addition to indoor sessions, I’m planning on expanding current services to offer outdoor venues to include gentle walks/hikes in nature and cuddling lakeside. In fact, I’m going to share my journey on my blog and invite you to join me in the adventure. 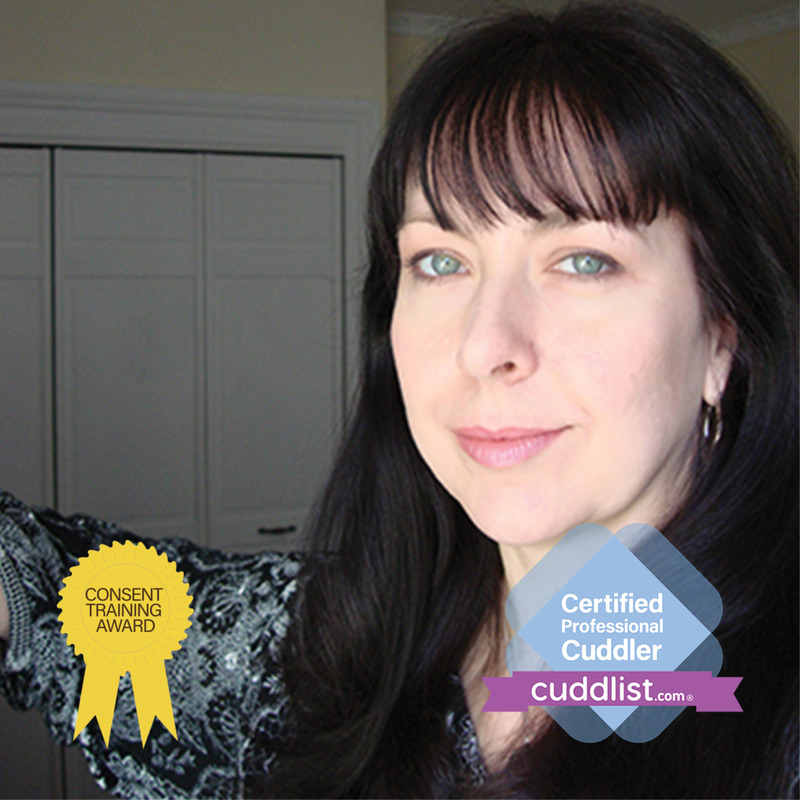 You’re invited to find out more about me at http://www.cuddleinyourarms.com. Prior to a session, we will talk via phone and “break the ice.” This is the time we can discuss the intake process, share the general structure of a session (of course, we’ll work on the details together), as well as take some time to get to know one another. If we both feel there’s a ‘connection’ and both parties consent, we will move forward with booking a consultation and/or session! At that time, I’ll e-mail you my Consent/Waiver Form for review prior to our session, and an original will be provided for signing upon your arrival. Please note that I require a valid Photo I.D. Payment is requested at the beginning of the session. I have a serene space designed to be warm and inviting, decorated in warm, earthy tones with a variety of lighting options to engage the senses and soothe the spirit. There’s even a private bathroom where you can change into your cuddle clothes and freshen up if you wish. The space is smoke- and pet-free, and can be scent-free on request but I also have a variety of aromatherapy options should you desire to add scent to your experience. In addition, I will have coffee/tea available, as well as complimentary candy/chocolate to help ‘ground’ you after our time together. Each session will be tailored to your needs, so whether you’re in the mood to chat or enjoy a quiet, contemplative cuddle; snuggle to the serene sounds of the ocean or forest; or get lost beneath a canopy of stars, you’ll be assured a wonderful experience that will engage your senses, soothe your soul, warm your heart and ease your worries. During your time with me, you will have my undivided attention. I will also follow up with you the next day with an ‘aftercare’ call to see how you’re feeling, answer any questions, etc. My session space is conveniently located, accessible from several major highways, and offers plenty of free parking. Out-calls will be available for established clients, or those who don’t have access to transportation and/or have issue with leaving their home. Important Note: I am sensitive to second hand smoke. Even the residue of it on hair or clothing can activate my allergies. Please let me know if you are a smoker so that we can discuss it. “I am a Marine veteran who currently lives a life almost completely void of touch. Karen has been a life saver. She’s slowly and carefully walking me through the steps I need to take to get to the life that I want. Her care touch and professionalism are beyond expectation and I’m grateful for her.” Justen T.
“Thanks to you, my body is smiling, my mind is at ease, and I feel an incredible sense of inner peace.” Chris D.
“…The best way I could describe the experience was that of receiving an emotional cuddling, and that of being welcomed and accepted with open arms, just to be held and enveloped in pure warmth, without any expectations and judgment. Laying there in the simple act of being embraced, held, and feeling of being cared for – that which if we are lucky we received the minute we came into this world – is simple but yet so profound in the emotional and physical impact that it has to the soul. Karen’s light, easy, caring, breezy spirit and disposition lowered my guard and for those unrushed 90 minutes, made me feel compassion, acceptance and pure joy from knowing people like her exist. A person that gets out of their comfort zone to sincerely care for and share their healing embrace and spirit with strangers. Request a session for availability. Appointments are scheduled evenings and weekends.